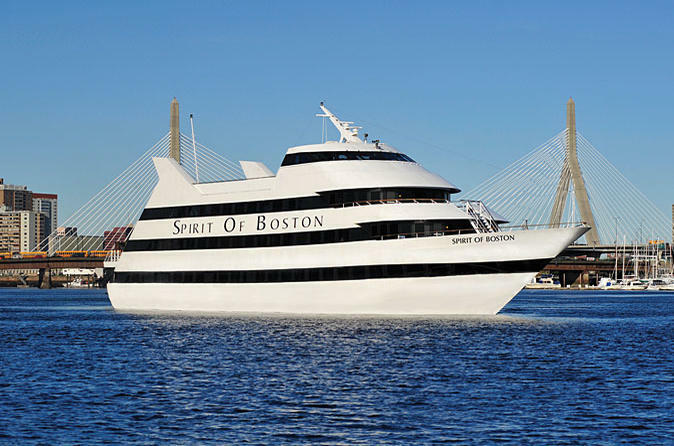 Enjoy spectacular views of Boston as you dine on an all-you-can-eat lunch buffet aboard a scenic cruise. See an endless stream of city sights, including Bunker Hill and the site of the Boston Tea Party. Enjoy a delicious all-you-can-eat buffet lunch with seasonal offerings. It’s a great way to spend the afternoon and take in all the sights of historic Boston! After you board your lunch cruise, have a little time to explore the boat as it pulls away from the dock. The lunch buffet will soon begin, and you can take as little or as much as you’d like from the all-you-can-eat buffet! While you dine, enjoy a narrated look at Boston's breathtaking skyline from the panoramic windows. After you eat, head to the top deck – the largest outdoor patio deck in town – to catch a breath of fresh air and an amazing view. Or, rock 'til you dock while the DJ plays a variety of music, from line dances to Top 40 hits. During your cruise, pass by the World Trade Center, the financial hub of Boston. See where the Boston Tea Party took place in 1773, when rebels disguised as Indians dumped tea into the harbor to protest British taxes. Pass by the location of the Boston Massacre, which is now a simple circle of cobblestones that marks the site where five American colonists were killed by British soldiers in 1770. The brutality of this incident helped spark the anti-British rage that ultimately led to the American Revolution. See the USS Constitution, also known as Old Ironsides, a nickname earned because of her invincibility in battle. Old Ironsides was launched in 1797 and is the oldest, fully commissioned naval vessel in the world. You’ll also see the World War II naval destroyer, the USS Casin Young. Then see the Tobin Memorial Bridge, erected in 1948-49 and opened to traffic in 1950. It connects the Charlestown section of Boston with Chelsea. Additionally, see Fort Independence and Castle Island. Fort Independence is located at the entrance to Boston Inner Harbor. First settled in 1634, the island features the nation's oldest fully maintained fort.